Increased interest in fish culture has also increased awareness of and experience with parasites that affect fish health, growth, and survival. Information provided on this page is intended for the novice fish hobbyist as a guide to common parasites of freshwater fish. Identification of parasites and their basic treatment is included; however, this information should not be substituted for consultation with an experienced fish health professional. NOTE: Mention of drugs or chemicals on this page in no way represents a recommendation for their use, nor does it imply that they are approved for use by the Food and Drug Administration or the Environmental Protection Agency. Most of the commonly encountered fish parasites are protozoans. With practice, these can be among the easiest to identify, and are usually among the easiest to control. Protozoans are single-celled organisms, many of which are free-living in the aquatic environment. Typically, no intermediate host is required for the parasite to reproduce (direct life cycle). Consequently, they can build up to very high numbers when fish are crowded causing weight loss, debilitation, and mortality. Five groups of protozoans are described in this publication: ciliates, flagellates, myxozoans, microsporidians, and coccidians. Parasitic protozoans in the latter three groups can be difficult or impossible to control as discussed below. Most of the protozoans identified by aquarists will be ciliates. These organisms have tiny hair-like structures called cilia that are used for locomotion and/or feeding. Ciliates have a direct life cycle and many are common inhabitants of pond-reared fish. Most species do not seem to bother host fish until numbers become excessive. In aquaria, which are usually closed systems, ciliates should be eliminated. Uncontrollable or recurrent infestations with ciliated protozoans are indicative of a husbandry problem. Many of the parasites proliferate in organic debris accumulated in the bottom of a tank or vat. 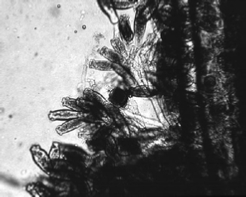 Ciliates are easily transmitted from tank to tank by nets, hoses, or caretakers' wet hands. Symptoms typical of ciliates include skin and gill irritation displayed by flashing, rubbing, and rapid breathing. The disease called "Ich" or "white spot disease" has been a problem to aquarists for generations. Fish infected with this organism typically develop small blister-like raised lesions along the body wall and/or fins. If the infection is restricted to the gills, no white spots will be seen. The gills will appear swollen and be covered with thick mucus. Identification of the parasite on the gills, skin, and/or fins is necessary to conclude that fish has an "Ich" infection. The mature parasite (Figure 1) is very large, up to 1000 µm in diameter, is very dark in color due to the thick cilia covering the entire cell, and moves with an amoeboid motion. Classically, I. multifiliis is identified by its large horseshoe-shaped macronucleus. This feature is not always readily visible, however, and should not be the sole criterion for identification. Immature forms of I. multifiliis are smaller and more translucent in appearance. Some individuals have suggested that the immature forms of I. multifiliis resemble Tetrahymena. Fortunately, scanning the preparation will usually reveal the presence of mature parasites and allow confirmation of the diagnosis. If only one parasite is seen, the entire system should be treated immediately. "Ich" is an obligate parasite and capable of causing massive mortality within a short time. Because the encysted stage (Figure 2) is resistant to chemicals, a single treatment is not sufficient to treat "Ich". Repeating the selected treatment (Table 1) every other day (at water temperatures 68–77°F) for three to five treatments will disrupt the life cycle and control the outbreak. Daily cleaning of the tank or vat helps to remove encysted forms from the environment. For more information, see Extension Circular 920, Ichythyophthirius multifiliis (White Spot) Infections of Fish. Chilodonella is a ciliated protozoan that causes infected fish to secrete excessive mucus. Infected fish may flash and show similar signs of irritation. Many fish die when infestations become moderate (five to nine organisms per low power field on the microscope) to heavy (greater than ten organisms per low power field). Chilodonella is easily identified using a light microscope to examine scrapings of skin mucus or gill filaments. It is a large, heart-shaped ciliate (60 to 80 m) with bands of cilia along the long axis of the organism (Figure 3). The organism is easily recognized at 100X magnification. Chilodonella can be controlled with any of the chemicals listed in Table 1, and one treatment is usually adequate. Chilodonella has been eliminated in tanks using re circulating water systems by maintaining 0.02% salt solution. Tetrahymena is a protozoan commonly found living in organic debris at the bottom of an aquarium or vat. Tetrahymena is a teardrop-shaped ciliate (Figure 4) that moves along the outside of the host. The presence of Tetrahymena on the body surface in low numbers (less than five organisms per low power field) is probably not significant. It is commonly found on dead material and is associated with high organic loads. Therefore, observing Tetrahymena on fish, which have been on the tank bottom, does not imply the parasite is the primary cause of death. One treatment of a chemical listed in Table 1 should be adequate for control. Identification of Tetrahymena internally is a significant but untreatable problem. A common site of internal infection is the eye. Affected fish will have one or both eyes markedly enlarged (exophthalmia). Squash preparations made from fresh material reveal large numbers (≥ 10 per low power field) of Tetrahymena associated with fluids in the eye. Fish infected with Tetrahymena internally should be removed from the collection and destroyed. Trichodina is one of the most common ciliates present on the skin and gills of pond-reared fish. Low numbers (less than five organisms per low power field) are not harmful, but when fish are crowded or stressed, and water quality deteriorates, the parasite multiplies rapidly and causes serious damage. Typically, heavily infested fish do not eat well and lose condition. Weakened fish become susceptible to opportunistic bacterial pathogens in the water. Trichodina can be observed on scrapings of skin mucus, fin, or on gill filaments. Its erratic darting movement and the presence of a circular, toothed disc within its body (Figure 5) easily identify it. Trichodina can be controlled with any of the treatments from Table 1. One application should be sufficient. Correction of environmental problems is necessary for complete control. Ambiphrya, previously called Scyphidia, is a sedentary ciliate that is found on the skin, fins, or gills of host fish. Its cylindrical shape, row of oral cilia, and middle bank of cilia identify Ambiphrya (Figure 6). It is common on pond-reared fish, and when present in low numbers (less than five organisms per low power field), it is not a problem. High organic loads and deterioration of water quality are often associated with heavy, debilitating Ambiphrya infestations. This parasite can be controlled with one application of any of the treatments listed in Table 1. Apiosoma, formerly known as Glossatella, is another sedentary ciliate common on pond-reared fish. Apiosoma can cause disease if their numbers become excessive. The organism can be found on gills, skin, or fins. The vase-like shape and oral cilia are characteristic (Figure 7). Apiosoma can be controlled with one application of one of the treatments from Table 1. Epistylis is a stalked ciliate that attaches to the skin or fins of the host. Epistylis is of greater concern than many of the ciliates because it is believed to secrete proteolytic ("protein-eating") enzymes that create a wound, suitable for bacterial invasion, at the attachment site. It is similar in appearance to Apiosoma except for the non-contractile long stalk (Figure 8) and its ability to form colonies. In contrast to the other ciliates discussed above, the preferred treatment for Epistylis is salt. Fish can be placed into a 0.02% salt solution as an indefinite bath, or a 3% salt dip. More than one treatment may be required to control the problem. Capriniana, historically called Trichophyra, is a sessile ciliate that attaches to the host's gills with a sucker. They have characteristic cilia attached to an amorphous-shaped body (Figure 9). In heavy infestations, Capriniana can cause respiratory distress in the host. One treatment from a chemical listed in Table 1 should be adequate. Several chemicals commonly used to control ciliated protozoans in freshwater fish are listed below for your convenience. As stated above, most ciliate infestations respond to one chemical treatment; however, fish that do not improve as expected should be rechecked and retreated if necessary. Over treatment with chemicals can cause serious damage to fish. The reader is also highly encouraged to read Extension Publication 673 (Mississippi State University), Calculation of Treatments, and UF/IFAS Fact Sheet Bath Treatments for Sick Fish. Copper sulfate is an excellent compound for use in ponds to control external parasites and algae; however, it is extremely toxic to fish. Its killing action is directly proportional to the concentration of copper ions (Cu++ ) in the water. As the alkalinity of the water increases, the concentration of copper ions in solution decreases. Consequently, a therapeutic level of copper in water of high alkalinity would be lethal to fish in water of low alkalinity. Conversely, a therapeutic concentration of copper in water of low alkalinity would be insufficient to have the desired action in water of higher alkalinity. For this reason, the alkalinity of the water to be treated must be known in order to determine the amount of copper sulfate needed. The amount of copper sulfate needed in mg/L is the total alkalinity (in mg/L) divided by 100. For example, if the total alkalinity in a pond is 100 mg/L, the concentration of copper sulfate needed would be 100/100 or 1 mg/L. If you are unsure how to measure the alkalinity of your water, or have never used copper sulfate, contact your aquiculture Extension specialist for assistance. Never use copper sulfate in water that has a total alkalinity less than 50 mg/L. Because of its algaecide activity, copper sulfate can cause dangerous oxygen depletions, particularly in warm weather. Emergency aeration should always be available when copper sulfate is applied to your system or ponds. Copper sulfate should not be run through the bio filter on a re circulation system as it will kill the nitrifying bacteria. If possible, tanks should be taken "off-line" during treatment with copper sulfate. If necessary, clean the bio filter manually to decrease organic debris and residual parasite load. For more information see UF/IFAS Fact Sheet FA-13, Use of Copper in Aquiculture and Farm Ponds. Potassium permanganate is effective against ciliates as well as fungus and external columnaris bacteria, and it can be used in a pond or vat. Multiple treatments with potassium permanganate are not recommended as it can burn gills. Aeration should be available when potassium permanganate is used because it is an algaecide and can cause an oxygen depletion. Potassium permanganate at the prescribed dosage (2 mg/L) does not seem to affect the nitrifying bacteria in a biological filter; however, ammonia, nitrite, and pH should be closely monitored following treatment. 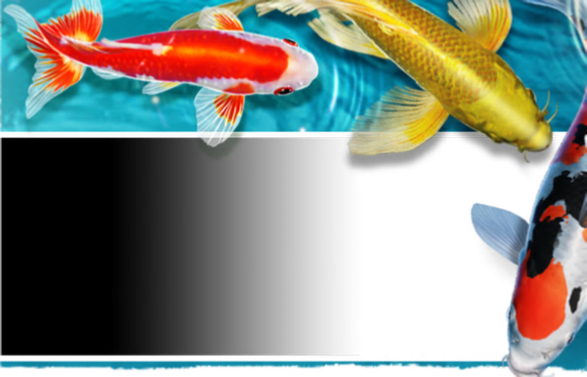 See also UF/IFAS Fact Sheets FA-23, The Use of Potassium Permanganate in Fish Ponds, and FA-37, Use of Potassium Permanganate to Control External Infections of Ornamental Fish. Formalin is an excellent parasiticide for use in small volumes of water such as vats or aquaria. It is not recommended for pond use because it is a strong algaecide and chemically removes oxygen from the water. Vigorous aeration should always be provided when formalin is used. Used in proper amounts, salt effectively controls protozoans on the gills, skin, and fins of fish. This is an effective treatment for small volumes of water such as aquaria or tanks. Use in ponds as a treatment is generally not recommended due to the large amount of salt and high cost of treatment that would be needed to be effective. When using any treatment for fish, a bioassay (a test to determine safe concentration) should be conducted on a few fish before large numbers of fish are exposed. Fish species can react differently to various concentrations of the chemical; therefore, fish undergoing treatment must be monitored closely for adverse reactions. If the fish negatively react to treatment, the chemical should be flushed immediately from the system, or the fish should be moved to fresh water. Tropical Aquaculture Laboratory of the UF|IFAS Extension publication library or click on the name to download the UF|IFAS .pdf white paper.